From the fact that it featured prominently in last week’s The News Quiz on BBC Radio 4, I gather that the Frank Borman segment a few weeks ago on “This American Life” titled “So Over the Moon” has gained a fair amount of traction. The conclusion of the TAL segment was that the Apollo 8 mission he commanded bored him, wasn’t enjoyable or interesting at all, and was in the end just a battle in the Cold War to him. 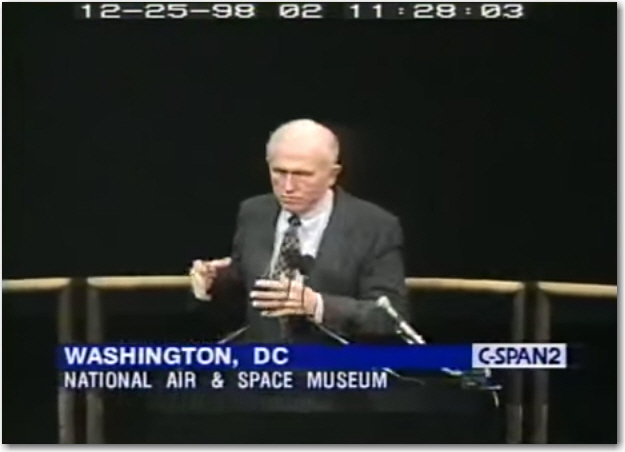 Regarding the “So Over the Moon” segment of episode 655, please relay to David Kestenbaum the link below of Frank Borman giving a talk at the National Air & Space Museum on the occasion of the 30th anniversary of Apollo 8 in 1998. I think Borman actually did have at least a little fun going to the moon and it held his interest a skosh more than he let on recently. Yes, he emphasizes in his 1998 talk the race against the Soviets as the most important part – as he’s always done – but he also tells great stories and cracks jokes left and right about the Apollo 8 mission during his 73-minute talk. He’s a funny guy – the opposite in some ways of the man I heard on TAL a few weeks ago. My 2015 article linked below includes a 6-minute clip I placed on YouTube of a portion of Borman’s talk plus a link to the full-length 73-minute video on C-SPAN’s site. We all get grumpy from time to time; perhaps it just wasn’t the best time to speak with him. What he shared of his wife Susan’s condition on TAL would beat anybody right down to the ground. They married in 1950. I can’t even imagine what he’s going through.